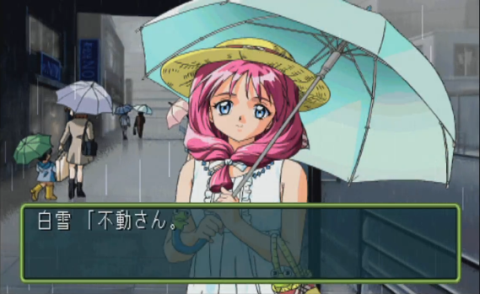 Tokimeki Memorial Series Part #35 - Spot the differences! Part 35: Spot the differences! Two brief tangents that I want to get out of the way before jumping into hard mode. 1) Over the weekend, I talked to a friend who lived in Japan when Tokimemo 2 came out, back in 1999. He told me that the Japanese community, when faced with the double-Miho problem, was utterly confused for the first week or so. And then, when word about what was really going on started spreading through the Tokimemo-playing community, the overwhelming response was "You brilliant BASTARDS!" He also gave me a lot more insight on why Tokimemo 3 killed the franchise so hard, which I'll get to... eventually. 2) I visited my best friend and his wife Miho yesterday, while she was still recovering from the birth of their beautiful baby girl, Momo. She laughed in my face when I told her that the goons had voted for the Miho path in Tokimemo 2, which she remembers from a few very frustrated college friends. Game mechanics note: there are several factors involved in whether or not a girl accepts your invitation in Tokimeki Memorial 2. The most basic factor is whether or not the girl likes you; the more she likes you, the more likely she is to say yes. After that is how much the girl wants to go to the date spot; it's easy to drag some people to an art exhibit, while others would infintely prefer the arcade. New to Tokimemo 2 are two factors: whether the girl has a club activity or date already scheduled for that day, and what the weather is like on that day. Kaedeko and Hikari will tell you they have baseball games or track meets on the third Sunday of the month, while most girls are less likely to go out if there's rain in the forecast. When you're talking to Miho, these factors change depending on which Miho answers the phone. Goon: Hello, is this the Shirayuki residence? Goon: Oh, Shirayuki-san? It's Fudou. Miho? : Ah, what are you calling about? 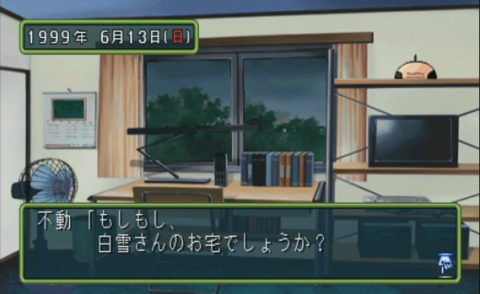 TL note: "Do you need something?/What are you calling about?" 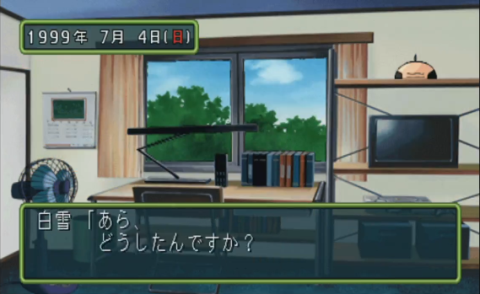 in Japanese is a fairly polite inquiry - indicating that Miho is the one on the phone. I think. Goon: Do you want to go to the zoo on the 20th? 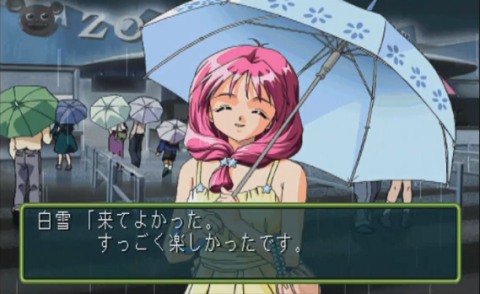 Miho: Sorry, my horoscope says I shouldn't leave the house that day. Miho: Ah, what are you calling about? Goon: Do you want to go to the amusement park on the 20th? Goon: Do you want to go to the amusement zoo on the 27th? 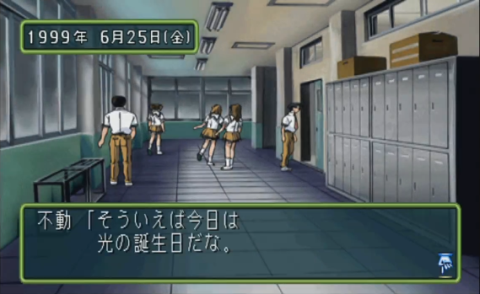 Miho: That day? Let me check the signs. Miho: Hmmmm, it looks fine. Goon: Okay, let's meet at the station square on the 27th. Miho: Yes, I see. Please don't forget! 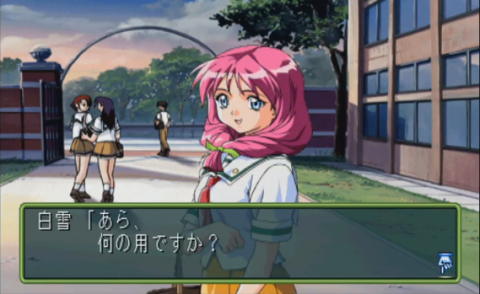 Note 1: For some reason, Miho seems to have double the after-school encounter rate of anyone else. 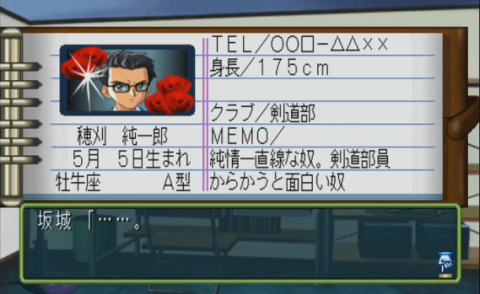 Note 2: The two Mihos have different preferences on what you should call her at different affection levels. You do not know which Miho you're dealing with when you choose what to call her, but you sure as hell will know as soon as you say something other than Shirayuki-san. Therefore, it's safest just to stick with the generic form of address for as long as you possibly can... unless you're intentionally trying to bomb yourself, which is a valid strategy for certain runs. Miho? : Oh, do you need something? Goon: If it's okay with you, want to walk home together? Miho? : One second, let me read the signs. Pretty sure this is Miho. Miho: Yes, I'll go with you. Goon: Cool, let's head out. I'll skip over a few reloads here with Miho saying no to things. 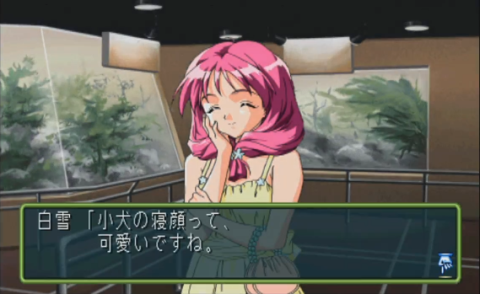 Miho eventually said yes to the zoo on the 27th. On with the run! Goon: Oh yeah, today's Hikari's birthday. Goon: Should I get her a present? Goon: Hmm, what should I give her? For friendship's sake, I went with the neutral option here. A track runner always needs new shoes, right? Goon: I wonder if Hikari's still around. Hikari: Hey. 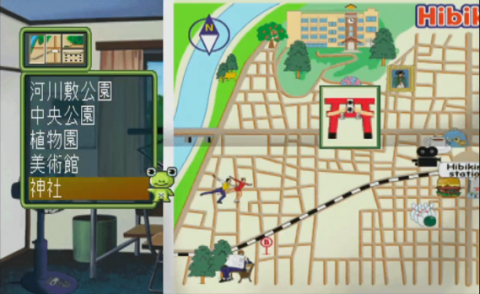 What's up, Gunma-kun? Goon: I got you a birthday present. Open it up! 6/27: Rainy zoo date with Miho? Miho? : Fudou-san, sorry I'm late. Goon: You're not late at all, I just got here too. Let's go. To tell the difference between Miho and B-ho in summer, there are three major visual cues: purse, hair accessories, and generally open or closed eyes when smiling. Because it's raining, there's a fourth visual cue: the umbrella. Because of the previous date, we know that this is B-ho. Goon: With this weather, we can't see any of the outdoor exhibits. Goon: Let's go see the animals indoors. B-ho: Sure, let's head that way. B-ho: Puppies sure are cute when they're asleep. Goon: Option 1: You're cute too, Shirayuki-san. Option 2: Yeah, that's a big part of why they're so popular at pet stores. Option 3: Want to knock on the glass and wake them up? Since this is B-ho, I spent some time thinking about this, and then decided to go for Option 1, flattery. B-ho: Geez, what did you come to the zoo for? Death glare. I guess that flattery doesn't work on B-ho! B-ho: That wasn't fun at all. B-ho: Never invite me anywhere again, please. Oh good, it's B-ho. Time to make up for the previous mistake. Goon: Yeah, that's a big part of why they're so popular at pet stores. B-ho: Yeah, now I want to raise one myself. Now we know what the right answer is for B-ho! But I want to reload until we see Miho. Goon: Want me to knock on the window and wake them up? B-ho: Ooh, great idea! I wanted to see them being startled awake, too. B-ho: I'm glad I came. This was super fun. B-ho: Please, invite me out again some time. B-ho: Let's walk together on the way back home. 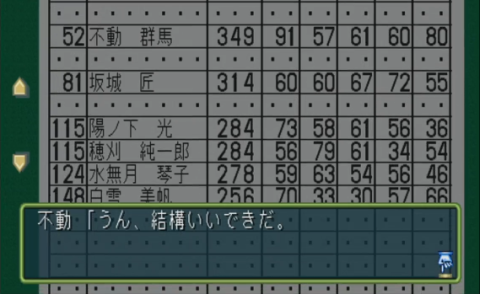 Alright, time to make a new save here, and reload until Miho. This is Miho. Note the hat, the white dress, the light blue umbrella with the frog on the handle, the white ribbon in her hair, the frog handbag, and the open eyes. The words are exactly the same as B-ho, so don't use that as your cue. 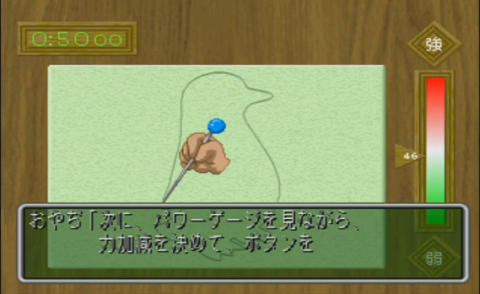 This is a clearer shot of the frog sticking out of Miho's purse. Miho: Puppies sure are cute when they're asleep. 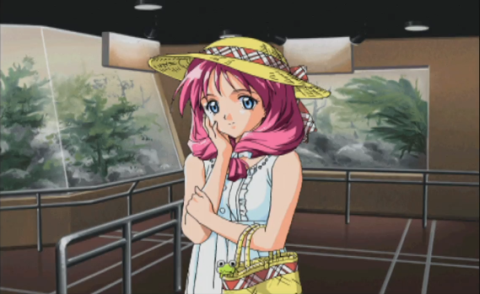 Option 1: You're cute too, Shirayuki-san. Miho: That's true. Now I want one too. You didn't see this at the fancy shop because Miho has an event there, but the two Mihos have the exact same conversations on dates, often with different reactions to each of the choices. However, there's no hard and fast rule to what one of them will like and the other will not. 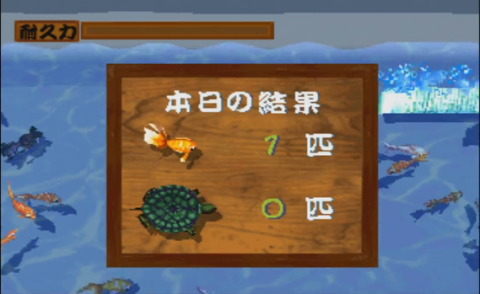 This is a cause for much frustration in Tokimemo 2 players! Miho: I was hitting some writer's block with my script, so this was a good change of place. Miho: I'm glad I came out. Hikari: Oh, awesome! I've always wanted this. Miho? : Fudou-san. I recognized your voice. Miho? : You're looking cheerful today. Two cues that this is B-ho: one, her mouth doesn't animate during the EVS function call. Two, her umbrella has no frog on it. If it wasn't raining, I'm not fully confident I could tell the difference without taking advantage of a programmer's oversight and staring at her mouth. B-ho: Yes, of course. Let's go. 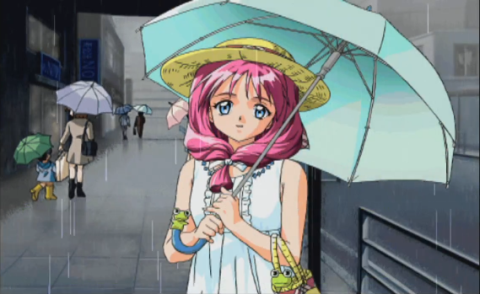 Here's a clearer look at Miho's frog umbrella. 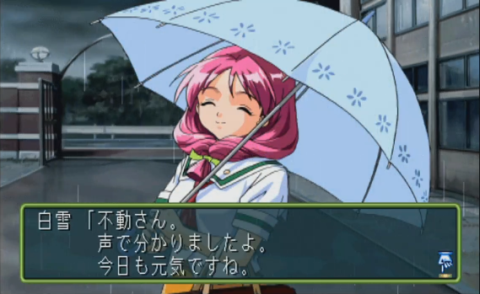 Goon: You're cute too, Shirayuki-san. Miho: What? No way! Geez, stop flattering me like that. Miho: Okay, it's time for me to head home. Mail order (far left): With this, you'll score perfectly on all your tests! "Self-hypnosis study device." New Spot (top left): Hibikino Bowl opens on 9/15. The first 50 customers bowl for free! Movie information (bottom left): Love Story on the Sunken Ship. "The blockbuster that broke the mold! If you haven't seen it yet, run to the theater before you miss out!" Ennichi (Top right, directly beneath the night parade): "The fourth Sunday of July is Ennichi at Hibikino shrine! 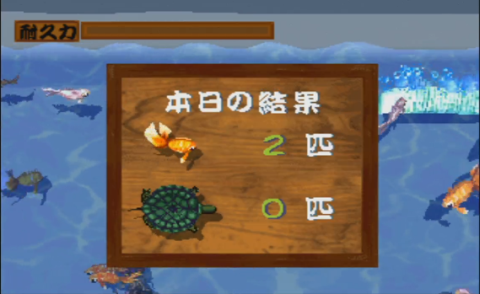 See your girlfriend in a yukata, and catch some goldfish!" 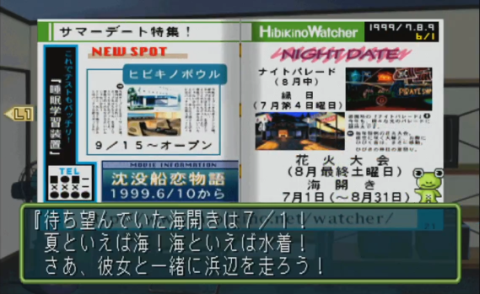 Fireworks (Right side): "There will be a fireworks show on the last Saturday of August! Experience Japanese art on the canvas of the sky!" The Beach (bottom right): "The beach opens to the public on 7/1! Summer means the ocean! The ocean means swimsuits! Run along the sands with your girlfriend!" Miho? : Ah, what's going on? This time, B-ho picked up the phone. I think. Goon: Want to go to Ennichi at the shrine on the 25th? B-ho: That day? Let me check the signs. B-ho: Hmmmm, it should be fine. 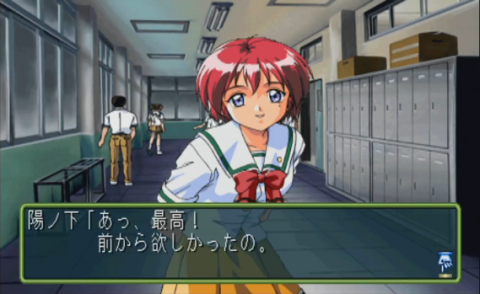 Again, this is the exact same line as Miho. The conversation has been different by about 2-3 words. Takumi: Who do you want to ask about? MEMO: Naive and straightforward. Kendou club member. Really fun guy to tease. Goon: Thanks, sorry to bother you. For the Cockblock ending, calling Takumi and Jun every weekend so they can't go on dates is a core strategy. Takumi's reaction to asking for details about guys is worth it at least once per run, though. Goon: Oh, there you are, Shirayuki-san. Miho? : Were you waiting long? Goon: I just got here myself. Which Miho is this? I actually don't know! They changed all of the cues! Miho? 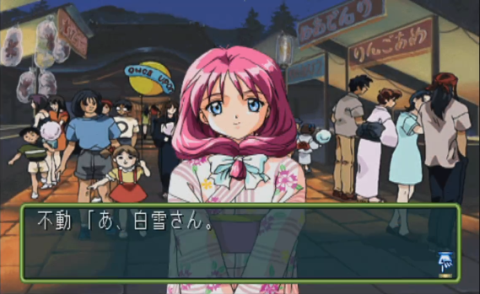 : I haven't been to Ennichi since I was little. Miho? : It's been a long time since I wore a yukata. What do you think? Goon: Option 1: It really suits you. You look cute. 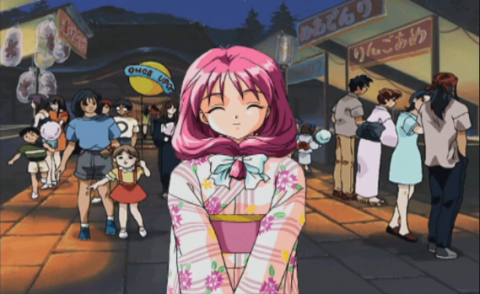 Option 2: That yukata is pretty, especially the pattern. Option 3: You really took care in putting on that yukata. Cultural note: As far as I understand it, there is pretty much one proper way to put on a formal yukata, along with all the sashes and ties that go with it. You can check out the simple 32-step process at this handy website! So while option 3 sounds a bit lukewarm to Western ears, it actually can be strong praise, given how involved the process is. A typical mistake is to tie it right over left; this is only done at funerals, and is a grievous enough mistake that people will run up to you and try to fix it if you get it wrong. A viewer on my stream also mentioned that if you tie a yukata improperly, it can be interpreted as, erm, a signal that the wearer is an easy package to unwrap, shall we say. So there's that, too. Goon: That yukata is pretty, especially the pattern. Miho? : That's disappointing. You're just looking at the yukata? Based on the response, I think that this is B-ho. B-ho? : Let's go somewhere that really says "Ennichi". 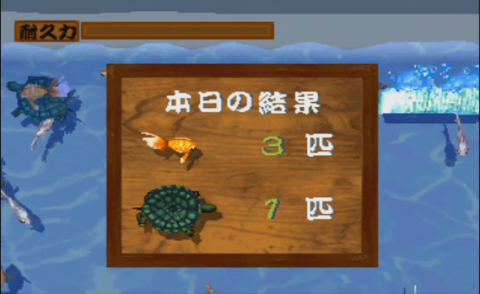 Katanuki/Die cutting is something that's pretty uncommon these days and is honestly not very fun as a minigame, so we're sticking to goldfish scooping for now. For a refresher on what goldfish scooping is, refer to Chapter 4 of the Tokimemo 1 LP. As a reminder, my personal real-life record is 23. I swear I'm better at it with a real scoop in my hands than with a controller. B-ho? : That's what you think of when you think of Ennichi? Then let's go. 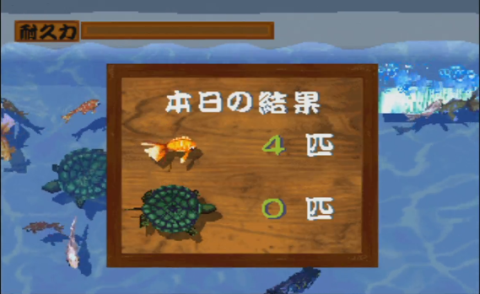 The golfish-scooping game in Tokimemo 2 is really simple, but also pretty satisfying to play. 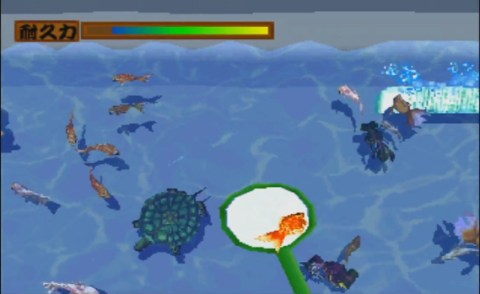 The top part of the screen has your scoop's health bar, while fish and turtles swim across the screen at variable speeds in random directions. Press Circle to dip the scoop in the water, then either hold it down to go deeper (to catch turtles, usually) or release the button to bring up the scoop. As in real life, the key is to avoid putting weight on the flimsy center, and rely on quick movements and the stronger edges of the paper. My first attempt ended up with 4 fish. Not a great score, honestly. B-ho? : If you can't catch at least that many, then it's no fun. B-ho: I may have been expecting too much, this wasn't very much fun. With a backhanded compliment and then a response like that, it's definitely B-ho we've been dealing with. And poorly! Well, this is the same conversation as B-ho so far, but that doesn't necessarily mean anything. B-ho? : It's been a long time since I wore a yukata. What do you think? B-ho? : W, whoa, saying I'm cute... you're making me blush. Okay, pretty sure this is B-ho. Miho would be happier to be called cute. I think. This run was even worse for my goldfish-catching. B-ho: If you can't catch at least that many, then it's no fun. Okay, that was definitely B-ho. Miho: It's been a long time since I wore a yukata. What do you think? Goon: Option 3: You really took care in putting on that yukata. Miho: Yes, my mom helped me. Miho: Tell me where you want to go next. I'll tell you your fortune. Okay, now I'm 100% certain that this is Miho. Miho: At this spot, the fortune is "your efforts will bear fruit." Three fish and a turtle this time. Not bad, actually. Miho: Hehe, just as I predicted. Miho: I was hitting some writer's block with my script, so this was a good change of pace. Open eyes this time around, so it's Miho. Miho: Th, thank you. I'm glad to hear that. My worst outcome yet! I don't think this was a good night for mini-games, honestly. B-ho: Yes, it's something I'm very proud of. For some godawful reason, I chose Katanuki here, even though I don't think the minigame is very fun at all. Heck, it's not even that fun in real life. 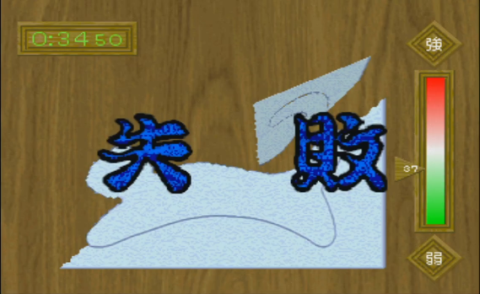 Katanuki is a festival game where you're supposed to cut a shape out of some disgusting candy (no, seriously, you're not supposed to eat it) using a toothpick or a needle. If you cut it out well enough, you get a prize. The best part of the prize is that it does not involve eating the candy, which is unsuitable for human consumption. 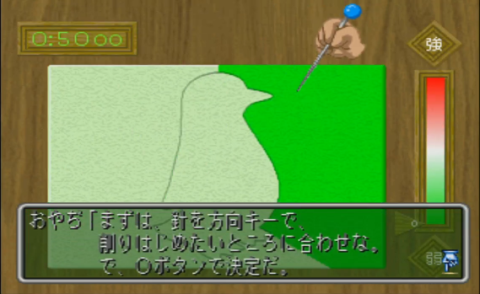 Because there's a d-pad involved and not an analog stick or a touchpad, the die cutting mini-game plays a lot more like a golf swing meter than a drawing mini-game. First, pick the section that you're going to cut out with the d-pad and the Circle button. Then, the power gauge will start bouncing between the red and green zones, and that's how much force you'll put behind the needle. Stay in the white area as best you can. You'll cut for as long as you hold down the Circle button. That's all there is to it, which is why I consider this one of the most boring mini-games in Tokimemo. B-ho: Hey! Man, it's like you've totally killed the fun! Translator's note: B-ho absently sticks a polite "desu yo" at the trailing end of this sentence as an afterthought. The rest of the sentence sounds a bit like how a fashionable, popular Japanese teenage girl would talk. Also, it feels like B-ho Death Glare deserves a count of its own. The RNG was kind to me and B-ho showed up again, so I was able to combine the best response to her yukata with average goldfish scooping results. The best answer, plus an average mini-game result, resulted in the mildly displeased response from B-ho, but I was willing to accept it and move on with the game at this point. These two months of game time took far longer than I expected to play through, and I'll try to make it to the next polling point before I stream again this Thursday. Next time: Summer camp and the Wrath of Bakuretsuzan!